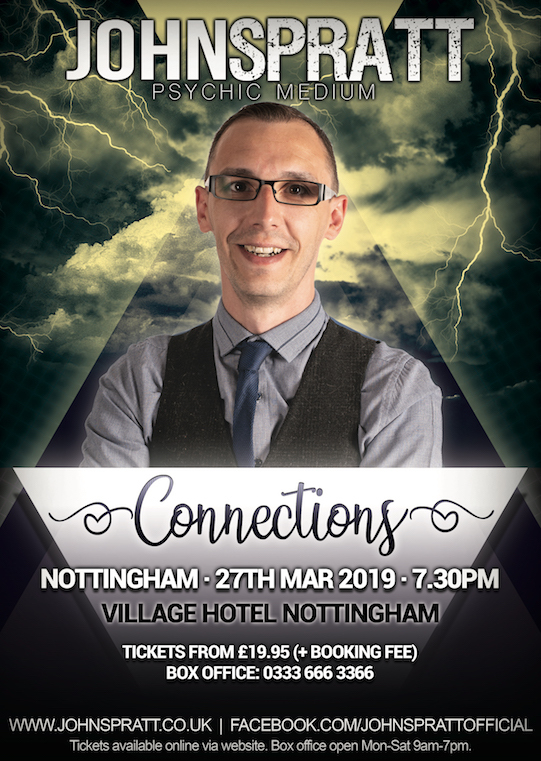 Connections Tour 2018/19 With Psychic Medium John Spratt. Take part in an evening of mediumship as TV's astounding international psychic medium John Spratt takes off throughout the UK and Ireland with the "Connections" tour. John will invite the spirit world forward, joining the two worlds as one, allowing John to connect with them to provide his audience with compassion and the comfort that their loved ones are always with them. John is renowned for his unique, high energy performances. He is straight to the point and says things as they come. Johns connections have brought love, laughter and comfort to many. Johns outrageous personality combined with his phenomenal connection with the spirit world is sure to leave everyone with a smile on their face. Readings cannot be guaranteed, but John hopes that everyone leaves his events feeling uplifted, knowing that their loved ones are still with them. Will you be one of the lucky ones as John connects the two worlds as one for this amazing event? Admission to the event and a gift. Exclusive 20 minute VIP group Q&A in which John will answer your questions and maybe a reading or two.